Who Does Your Garden Grow? Geranium ‘Johnson’s Blue?’ Ditto for Norah Leigh, immortalized by Phlox paniculata’Nora Leigh’ and Viola ‘Nora Leigh.’ What about E. B. (Bertram) Anderson, born in 1886 but living today in your garden as Sedum ‘Bertram Anderson?’ Why is there a dianthus named ‘Joan’s Blood?’ And just exactly who was this Madame Hardy? It’s delightful reading. One attains a much stronger understanding and appreciation of gardening history, and while turning the pages you’ll travel to England, across Europe, to Asia, The Himalayas, South Africa, and beyond. The book is also beneficial as a gardening guide in that so often the gardening tastes and theories of our planet’s great botanical explorers are sensitively conveyed. 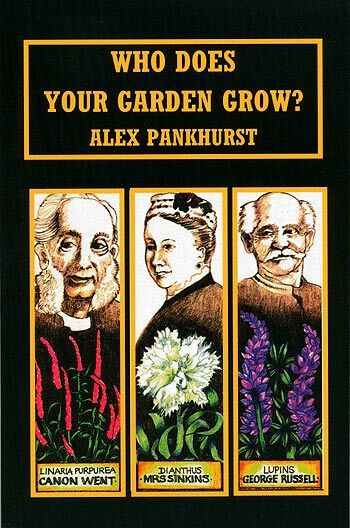 Personalities shine in this wonderfully written volume, as does author Alex Pankhurst’s wicked sense of humor. This is a great book with which to cozy up to the fireplace on a cold winter’s night. The book is available from full service bookstores and Amazon, but a hint when ordering books: Don’t order from Amazon unless you’re having trouble paying the heating bill, because the author and publisher profit only pennies on the dollar. Small publishers (and starving authors!) receive fair reward for their labors only when you order their books directly from them. To order: www.mackeybooks.com.